The Hormone Diet called The Perfect 10 Diet: 10 Key Hormones That Hold the Secret to Losing Weight and Feeling Great-Fast! was created by Dr. Michael Aziz, an attending physician at St. Vincent’s Hospital, New York, who also maintains a private practice on Madison Avenue in Manhattan. Aziz says that the latest medical research indicates that hormones are the key to weight loss and that by balancing the body’s levels of 10 key hormones it is possible to boost energy and achieve your ideal weight. He says that dieters can lose up to fourteen pounds in just twenty-one days without feeling hungry, while also boosting energy, reversing the aging process and looking younger. Aziz explains how they affect weight loss and health and he also describes how the foods you eat can impact your hormonal balance and discusses the nutrients your body needs in order to promote optimization of your hormones. A hormone diet believes that the true cause of weight gain is refined carbohydrates rather than fat. As such the diet he promotes eliminates sugar, processed foods, diet food and light foods. Instead dieters are encouraged to consume whole eggs, full-fat dairy products, seafood, poultry, whole grains, low glycemic index fruits as well as an abundant intake of vegetables. The initiation stage for fast weight loss that is followed for three weeks and involves eating a low carbohydrate diet that eliminates grains and alcohol. Lasts until you have achieved your health and weight loss goals and allows for the addition of whole grains and alcohol in small amounts. Can be followed as a lifestyle maintenance plan and includes a higher amount of grains as well as occasional sweets. For all of the three stages dieters are permitted three meals and one or two snacks daily. The book also includes tips to get you started and overcome stubborn weight gain as well as recipes from famous New York restaurants such as Maison and The Russian Tea Room. Eggs, shellfish, poultry, wild salmon, olive oil, oranges, broccoli, cauliflower, cabbage, bok choy, kale, oatmeal, organic yogurt, butter, legumes, berries. Exercise is an important component of a hormone diet and dieters are encouraged to engage in an hour of walking every day if weight loss is desired. In addition to daily aerobic exercise it is recommended to perform strength training exercises for forty five minutes on three or four days of the week. The Perfect 10 Diet: 10 Key Hormones That Hold the Secret to Losing Weight and Feeling Great-Fast! retails at $24.99. Encourages the intake of unprocessed and organic food. Encourages the intake of whole grains and low glycemic index carbohydrates. Emphasizes the difference between healthy and unhealthy fats. Debunks some of the myths about dieting and weight loss. May reduce the risk of high cholesterol, heart disease, hypertension and cancer. Can be followed as a lifestyle approach to weight management. Includes over 70 recipes from famous New York City restaurants. May be difficult for vegetarians to follow. Promotes unrealistic weight loss expectations. Some dieters experience fatigue on reduced carbohydrate diets. 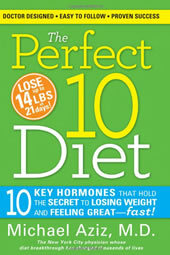 Although the Perfect 10 Diet may at first glance appear similar to other reduced carbohydrate diets such as the Zone Diet, this book provides unique information about the impact of hormones on weight loss, metabolism, and health. By following a hormone diet, dieters will enhance their nutritional intake, while at the same time promoting optimal hormone levels and weight loss in an eating plan that can be followed as a long-term approach to a healthy diet.